This is another of the first images sent back to Earth from the NASA's EPOXI mission after it flew by comet Hartley 2 around 7 a.m. PDT (10 a.m. EDT) on Nov. 4, 2010. A NASA spacecraft has beamedback the first close-up photos from its rendezvous with a comet ? and theimages show an ice ball that looks like a giant chicken drumstick, or perhaps apeanut or bowling pin. The five photos bracket thetime of closest approach. 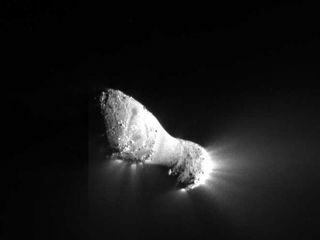 Deep Impact took thousands of images duringthe flyby, and these pictures will continue to flood researchers' computers inthe hours and days to come, researchers have said.